*Present address: ESTEC/ESA Electromagnetics Division, P.O. Box 299, 2200 AG Noordwijk, The Netherlands. 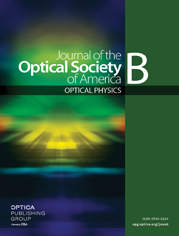 The band structure for an absorptive two-dimensional photonic crystal made from cylinders consisting of a Drude material is calculated. Absorption causes the spectrum to become complex and form islands in the negative complex half-plane. The boundaries of these islands are not always formed by the eigenvalues calculated for Bloch vectors on the characteristic path, and we find a hole in the spectrum. For realistic parameter values, the real part of the spectrum is hardly influenced by absorption, typically less than 0.25%. The employed method uses a Korringa–Kohn–Rostoker procedure together with analytical continuation. This results in an efficient approach that allows these band-structure calculations to be done on a Pentium III personal computer.